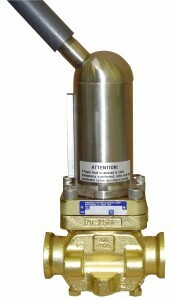 The Hansen Sealed Motor Valve is a truly unique motor operated valve which eliminates the most common concern of ther motor operated valves, valve stem seal leakage. The Sealed Motor Valve has no valve stem seal because the non-electric rotor is enclosed in a stainless steel can which contains the fluid pressure. The electric stator is outside the stainless steel can, and is isolated from the fluid in the valve.